When I had my first, he had a bib on quite often, initially for the dribble and later it was for all that mushy food. I don’t know what it is with the second child but you tend to be more lax about things. So, I haven’t really bothered with bibs as much this time. I’m not really sure why, she has so many. It’s most likely some laziness on my part, which is silly because having to wash messy clothes is more work than me just having put on a bib. This lack of sleep thing really messes with your head, my lack of bib usage is clear proof of my lack of logic. 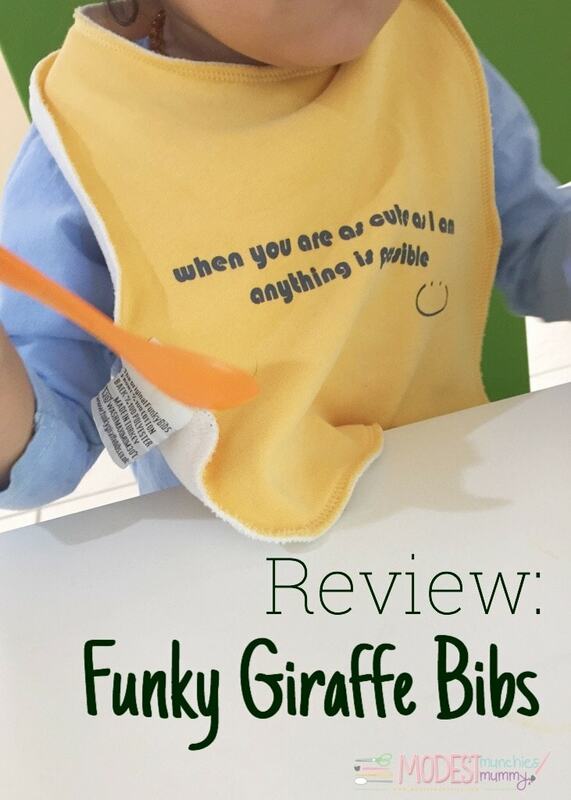 I was recently sent these gorgeous bibs from Funky Giraffe for review. Funky Giraffe has had great success in the UK and by popular demand is now offering their bibs here in Australia. I figured I’d give them a try, some extra cute bibs are sure to work as motivation to get my little cupcake wearing them. I was browsing through their online store and was impressed by the number of different patterns and styles. 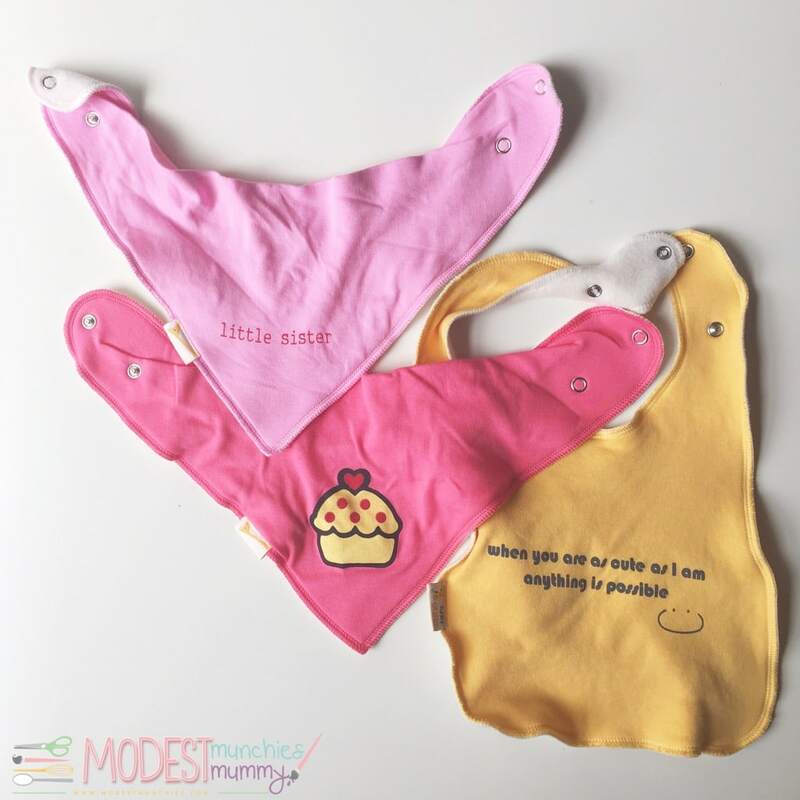 Their range includes a lot of the bandanna (triangle) style bibs, I’m not a huge fan of those but they seem to be a popular choice with most parents. The patterns are all so wonderful and fun and I found it very hard to choose. I eventually settled on the bibs in the picture above and love the designs. The quality is fantastic. The cotton makes the bib thick and absorbent while maintaining a soft texture and the fleece fabric on the back is ideal for keeping wet food and juices off baby’s chest. They’ve washed really well and have maintained their soft texture, absorbency and shape. Like I mentioned above, I’ve never been a fan of the triangle style bibs, but I have been using them and think they look super cute. They also cover less chest space which can irritate a fussy toddler much less than the fuller bibs. One of the things I love about these bibs is the snaps on the back. Most bibs use velcro to secure the bib around the neck but these use snaps instead. It’s a much welcomed change. If you’ve ever washed velcro bibs you’ll know that they stick on to everything in the wash! The bibs also won’t get pulled off like the velcro style bibs can. The snaps are in different positions to allow for a bigger neck gap as the child grows – perfect! 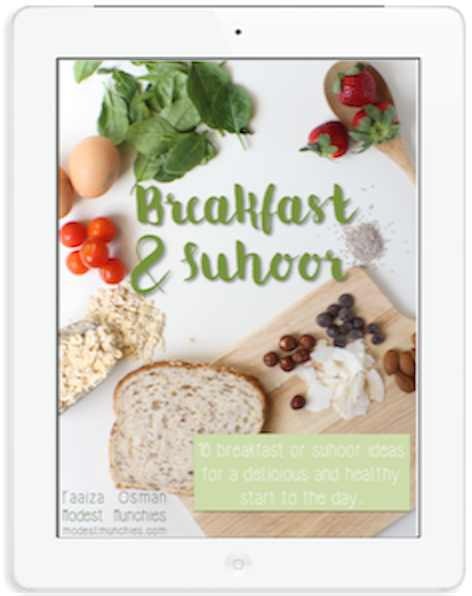 Cute designs, great quality, they wash well, what more could you ask for in a bib? If you want to win a set of your own, read more below. 1. Must be an Australian Resident (or have an Australian address). 2. Must be following me Modest Munchies on Instagram. 3. Must tag 2 friends for each entry. 4. Must tag 2 different friends for each additional entry. 5. Entrants can only win one set (3 winners chosen, 1 for each set). 6. Competition open till midnight Tuesday 1 September. 7. Winners will be announced via Instagram Wednesday 2 September. These are super cute- love the designs and patterns! 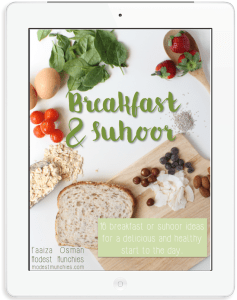 My husband and I were talking about this yesterday- we were so uptight about everything with our first, and now with Zunaira we take things so easy loll! 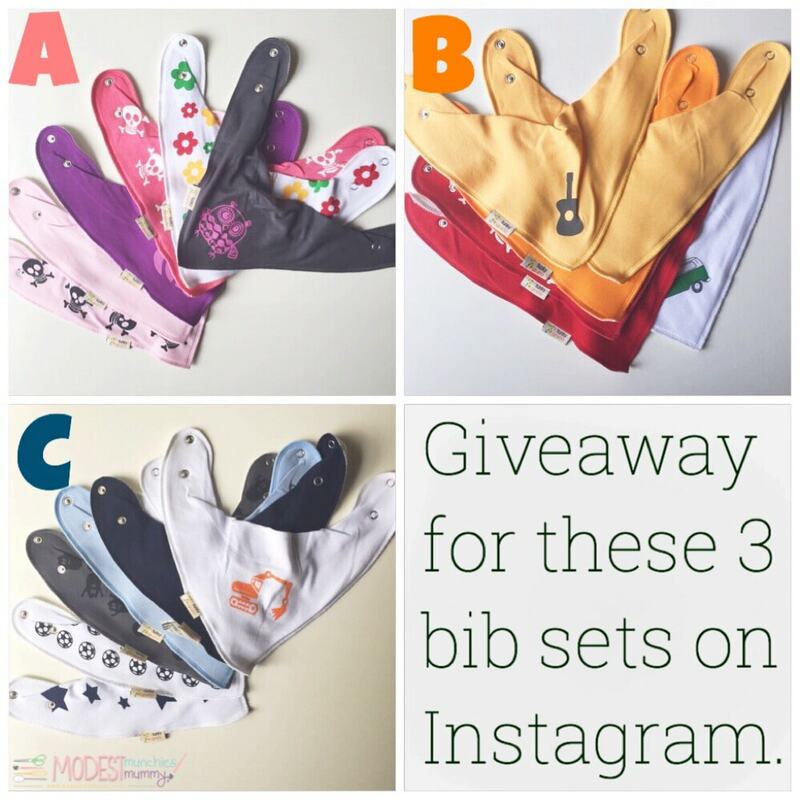 These are such adorable bibs! HAHA. Yes definitely. Having to take care of 2 is hard work!